After a warm weekend, a cold front is expected to move in. 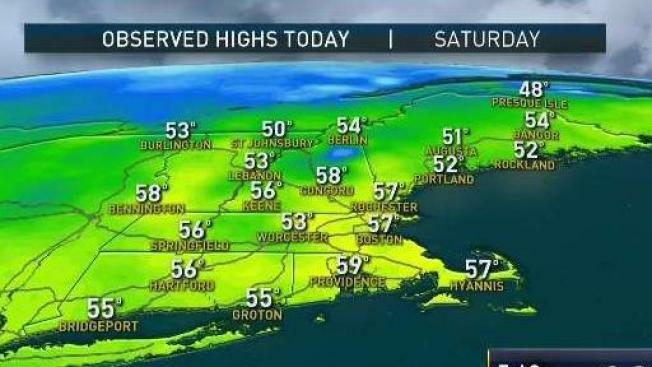 A few towns managed to hit 60 degrees today, including: Norwood 61 and Fitchburg, Beverly and Lawrence at 60. In Boston the high temperature climbed to 57, which was 13 degrees lower than the record of 70 for the day. That 57 was about eight degrees above average for this time of year. We're expecting some changes overnight. Clouds will increase out ahead of a cold front moving in. A couple of showers are possible. The front will clear out by daybreak and temperatures end up in the 40's tomorrow. Flurries are possible during the afternoon. A moderate snowfall is possible in the Green and White mountains Sunday and Monday where several inches is possible. Temperatures gradually warm back into the 50's by the middle of the week. If you haven’t put up your outdoor Christmas decorations, that would be a good day to do it. Temperatures gradually pull back slight by the end of the week. It's been a fairly quiet stretch of weather lately (except for that round of rain on Wednesday). A significant storm is possible more and more likely by the end of the 10-day forecast period. Next weekend looks interesting. It should be warm enough for mainly rain, but some snow is possible in the Merrimack Valley and the mountains of Vermont and New Hampshire.